Poker history is chock full of players who have called their shot. Lex Veldhuis did a few weeks ago, Mark Newhouse wishes he didn’t do it when he finished ninth in the WSOP Main Event for a second consecutive year. In a lot of cases, it’s a combination of confidence, ego and a little bit of fun. 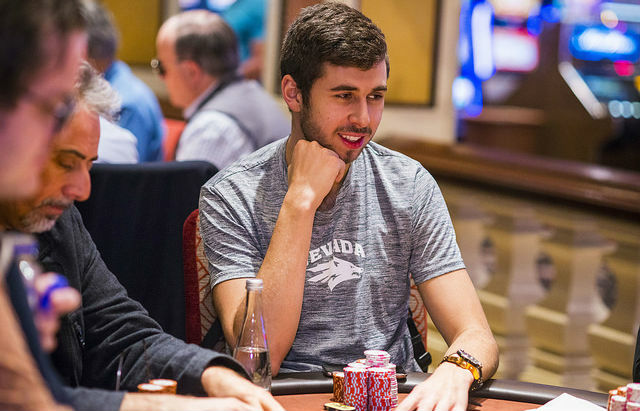 So when Sean Perry said last week that he was going to win the World Poker Tour Five Diamond Classic, it was mostly met with a good-hearted chuckle or two. Perry, son of longtime Las Vegas poker pro Ralph Perry, wasn’t even eligible to play in this tournament last week. He didn’t turn 21 years old until Monday, Day 1 of the event. “I played on Poker Night in America the other night and telling people on the show that I was winning this. Jennifer (Tilly) just tweeted about it,” said Perry. Perry says he actually started predicted victory since the summer. Perry, who grew up and lives in Las Vegas, knew there was a chance he’d be able to play the event, and once the WPT Season XVI schedule came out, he was stoked. “Once I found out it was on my birthday, I told everyone this is my tournament,” said Perry. This isn’t some crazy story of a kid winning the first tournament he ever played in though. He’s got $110,318 in lifetime tournament earnings, all from the Seminole Hard Rock Casino in Hollywood, Florida where the legal age to play is 19. He’s also played high stakes cash for the last two years. “I am definitely pretty confident. I’ve had pretty good success so far since I left college. I’m playing pretty high cash, up to $50/$100. I’ve been there a lot,” said Perry. The game is in his DNA. He started playing Chinese Poker against his father when he was about four years old. Since then he’s been focused on his 21st birthday and properly starting his own pro poker career. Ralph Perry finished 47th for $27,567 while Sean Perry continues to hang out near the top of the chip counts with just 11 players left.